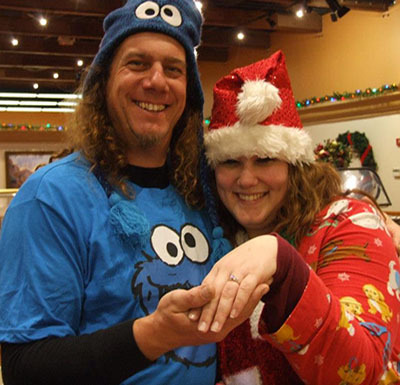 Welcome to Newsletter issue #104! I know it's been a while, so I thought I'd share what I've been working on since last November! 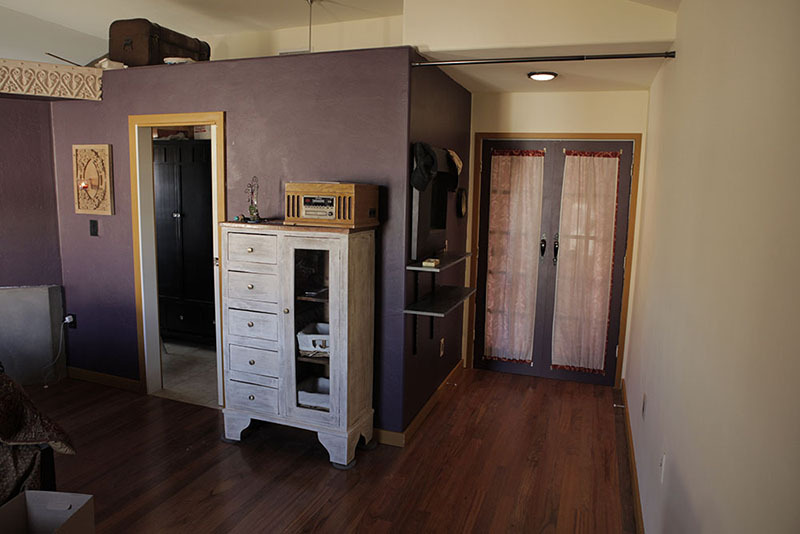 After four years of being a construction storage room, and two months of grueling, exhausting, overwhelming, discouraging but adventuresome labor, we finally have a nearly finished "master suite"! 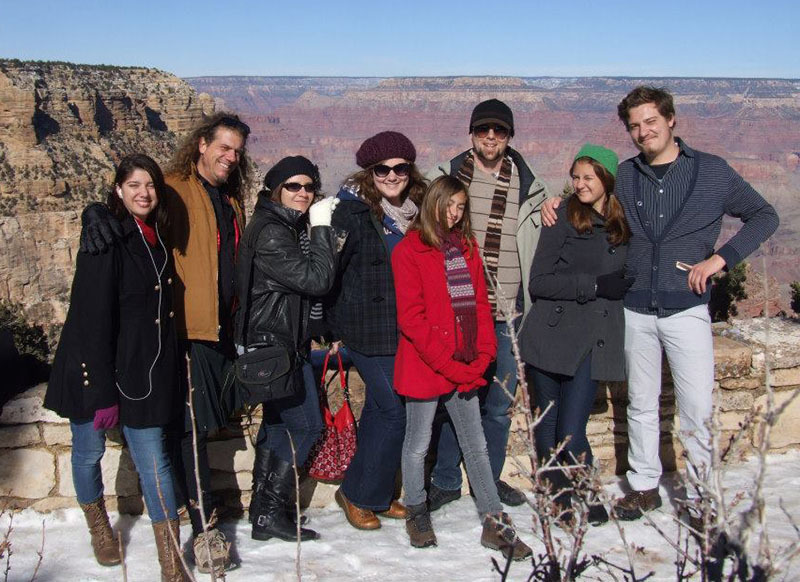 Many of you have been following the newsletter for years and are aware that my children and I built our own home here in the high desert of southeast Arizona. We did everything from leveling out the hill, building the footings and pouring the foundations, to the framing, insulation, plumbing, electrical and finish work. I haven't added it all to the new website yet, but you can click HERE to see the steps of us building it. We moved in in October 2008, but the master bedroom/bathroom remained unfinished for all this time. Finally this winter I dove back into it and we 'moved' in there this past weekend. 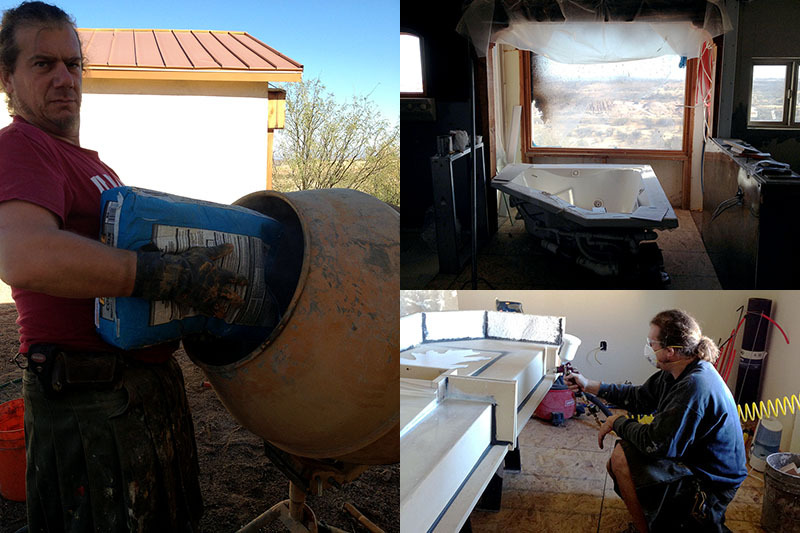 (right and below left) The centerpiece of the master bathroom is our concrete sink. Weeks of design, model building, form consruction, concrete pouring and finishing, plumbing and installation went into creating this unique bit-o-sculpture for washing our hands. 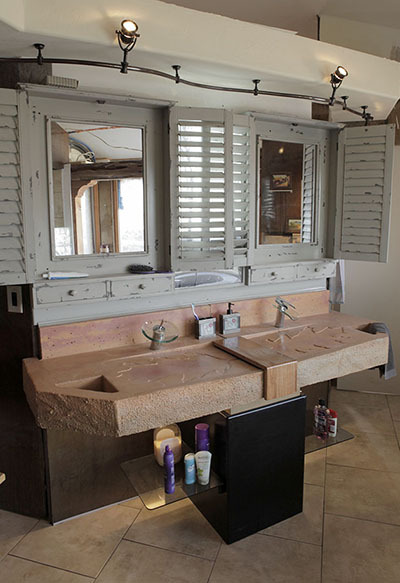 A stained and sealed oak mesa rests in the middle concealing the drain and towel 'bars' are built into the concrete. During the winter, tubes embedded in the concrete carry hot water to turn this into 650 lbs. of concrete heater for the room and make nice towel warmers. (below right) This two person step down shower includes more shower heads than a hydra. I just took the first shower in it this weekend and it felt all fancy like! (left) This Jacuzzi tub has been sitting among the leftover sheets of drywall, bags of cement, and stacks of tile for four years waiting for me to finally install it here! 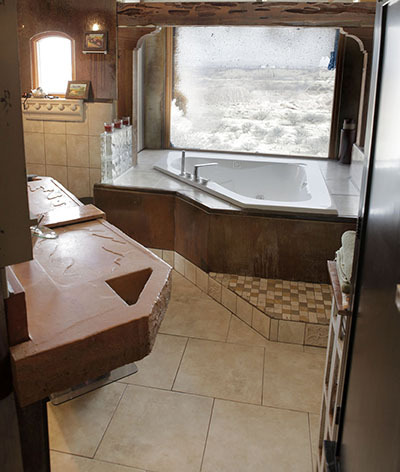 The bay window (still in much need of scraping) adjacent to the tub opens into the valley to the east of the casa. 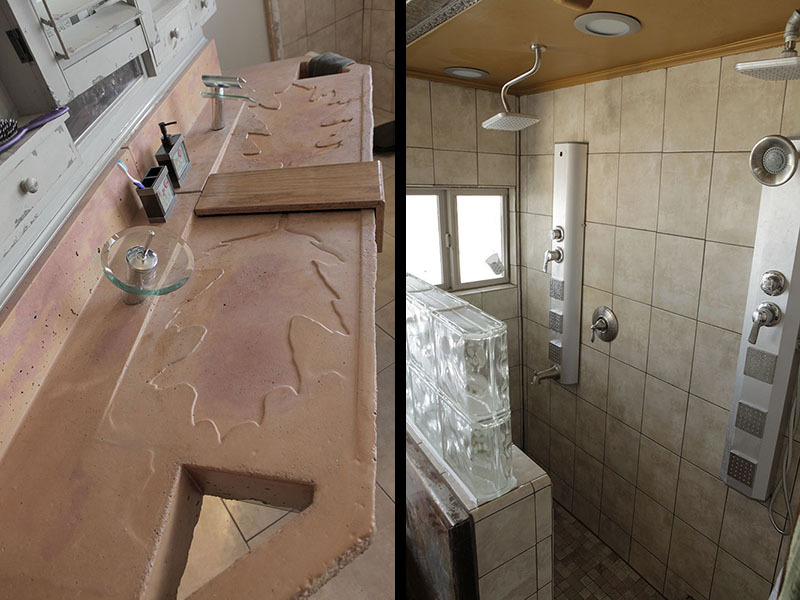 Like other walls in the bathroom, the tub surround skirt is made of rusted, corroded and auto enamel sealed metal; a treatment I fell in love with when I saw it in a restaurant near my booth at the Kimball Arts Festival in Park City, Utah. The wood that spans across the space above the tub is a 6"x8" pecky cedar beam like those I used to bridge other spaces throughout the house. 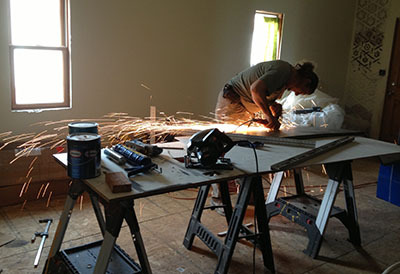 (below) Grinding metal destined to become part of the tub surround skirt. (above right top) The tub area 'before'. (above right bottom) Spraying a coating on the concrete sink forms to smooth the surface and ease releasing the forms from the cured concrete. You can somewhat see one of the 'leaf' cutouts. 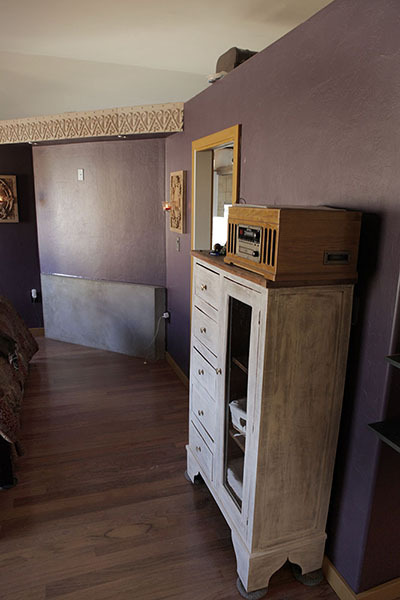 (left) The wall dividing the bedroom from the closet and bathroom includes a concrete slab (lower left in the picture) that serves as the heater for the room with hot water tubes embedded in it. This is right behind the concrete sink in the bathroom. I installed similar concrete heat walls in the other two bedrooms this past winter and have been quite pleased with the results. They never get too hot and warm up the room comfortably without forced air. 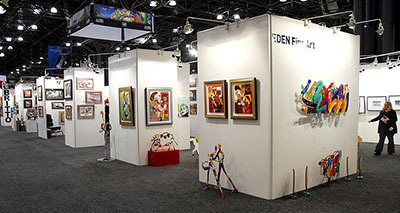 For over thirty-five years, Artexpo has been the world's largest fine and popular art marketplace, bringing the biggest publishers, galleries, interior designers, architects, corporate art buyers and collectors to the center of the North American art world; New York City! Watch for more new art in the next issue! 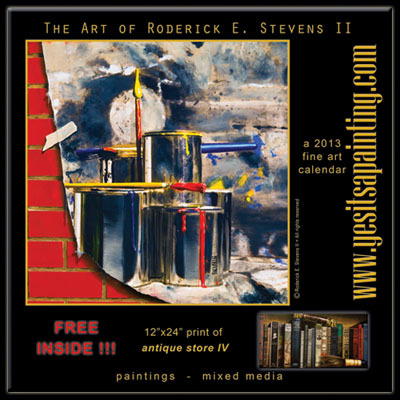 DON'T FORGET YOUR 2013 FINE ART CALENDARS!!! I am giddy with excitement for 2013 and all the new avenues I'm exploring for "yes it's a painting" and I'm anxious to share lots of new artwork with you soon! I hope 2013 is off to a spandifulous start for you all! Thanks as always for being a part of my adventure. See you soon!